After registering you will receive an email with a link to submit the abstract. Payment for the symposium can be done through Paypal, bank transfer or pro-forma invoice. (*) Students & Postdocs fee: a short CV and a letter by the supervisor is required to qualify for the student/postdoc fee. 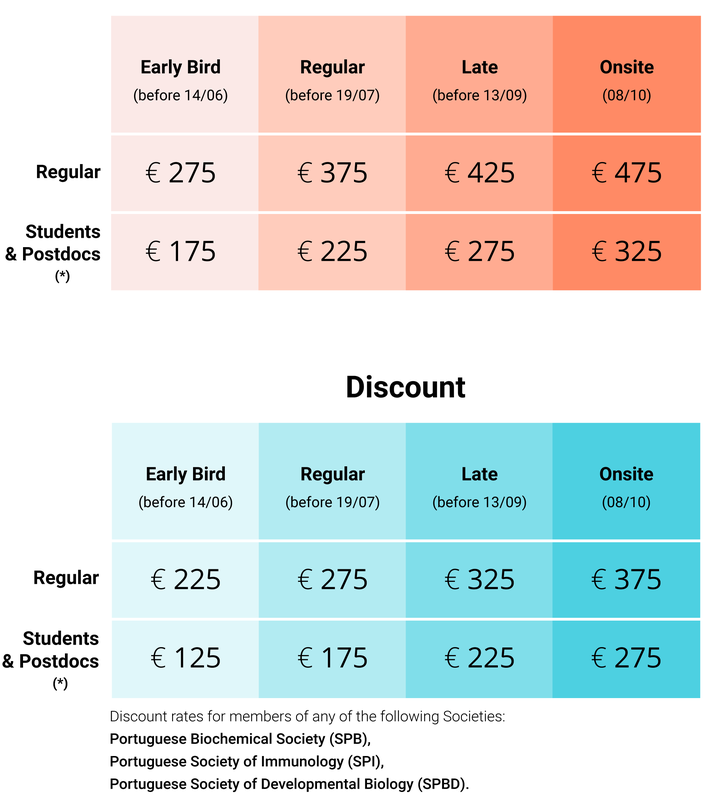 Please send us an email to symposium@research.fchampalimaud.org, using the email subject “Student/Postdoc Fee”. Payment is in € (EURO). The registration fee includes admission to the sessions, coffee and snacks during breaks, lunch snack and a welcome cocktail reception. Accommodation, breakfast and dinner are NOT included in the registration fee. Cancellation policy: Refund of full payment minus a handling fee of €40 by September 30th, 2019; no refund thereafter. Liability disclaimer: The organizers do not accept liability for personal medical expenses, travel expenses, or any other personal expenses as a consequence of accidents or weather conditions. Please select the option “I wish to apply for a travel award” in the abstract submission form. A limited number of travel grants are available for early-career researchers. The Scientific Committee will select the travel awardees based on the quality of the submitted abstract. Applications for the Symposium Volunteers Programme are now OPEN! We have a very limited number of spots for volunteers for the 2019 Champalimaud Research Symposium. Volunteers will receive free entrance to the symposium, and will help with different tasks such as registration, setting up poster stands and guiding participants. It may be necessary for volunteers to miss a small part of the symposium programme due to their duties, but we will accommodate as much as possible your preferences. Applications for the Volunteers Programme will close on May 31th, 2019. Join us and together let’s create an exciting scientific event!